Do you spend too much time on insignificant tasks? Want to have more time to do what you do best? 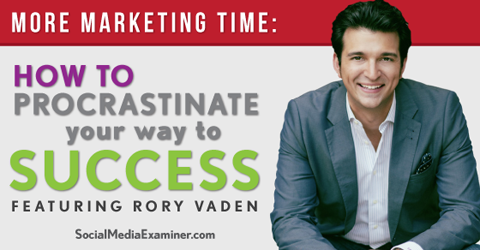 To learn how to multiply your time as a marketer by procrastinating, I interview Rory Vaden. In this episode I interview Rory Vaden, the co-founder of Southwestern Consulting, an organization designed to empower sales pros. He’s the author of Take the Stairs. His newest book is Procrastinate on Purpose: 5 Permissions to Multiply Your Time. In this episode Rory will explore how busy marketers and business owners can get ahead by procrastinating. You’ll discover how the principles of time management have changed over the years, as well as why and how to embrace the focus funnel. Listen as Rory Vaden shares what marketers need to know about procrastinating your way to success. Raised by a single mother who sold Mary Kay cosmetics, Rory grew up around women who taught him the principles of success. Rory says it also means he knows more about makeup than cars. During college at the University of Denver, Rory was recruited to work in a program called Southwestern Advantage, where he sold educational children’s reference books door-to-door and eventually managed salespeople. He says that’s where he developed a passion for sales. In 2006, Rory and three others started Southwestern Consulting, with the mission to help salespeople achieve their goals in life. They now have 115 team members and are working with more than 1,000 people. Rory’s second book, Procrastinating on Purpose, addresses the question, “How do the most successful people today think about time and do they believe the same clichés we often hear about time management?” Rory says a lot of them don’t. Listen to the show to discover what launched Rory’s speaking career. Rory says there is no such thing as time management, only self management. In the world we live in today, time management isn’t just logical, it’s emotional. Our feelings of guilt, fear, worry and anxiety, as well as our desire for success and our need to feel valued dictate how we spend our time—as much as our inbox, our to-do list and our calendar do. There’s also a new type of thinker that has emerged: the multiplier. Rory shares the history of time management. Era one time-management thinking is one-dimensional. It was developed in the 1950s and 1960s, and was all about efficiency. All things being equal, doing things faster is better. However, there is a point of diminishing returns with efficiency. Era two time-management thinking is two-dimensional. 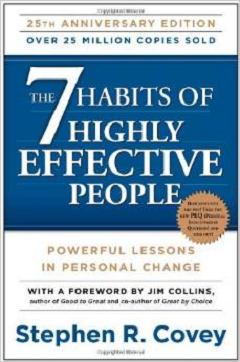 This was ushered in by Dr. Stephen Covey, author of The 7 Habits of Highly Effective People, in the late 80s. Dr. Covey gave us the time-management matrix. The Y axis was importance (how much something matters) and the X axis was urgency (how soon it matters), so it was a way to score tasks and prioritize based on their score. While prioritizing is a relevant skill today, there is a massive limitation—nothing about prioritizing creates more time. Rory believes you cannot solve today’s time-management problems with yesterday’s time-management solutions. People who are multipliers, Rory says, add a third calculation: significance. It takes a two-dimensional square and turns it into a three-dimensional cube. Importance is how much this matters. Urgency is how soon this matters. Significance is how long this is going to matter. While there is nothing you can do to create more time in one day, there are certain things you can do today to increase time tomorrow. Without the significance calculation, Rory explains, we inappropriately overweight the urgency calculation. Therefore, we end up always doing things that are urgent. Multipliers have realized that success is no longer related to the volume of tasks we achieve, but rather their significance. 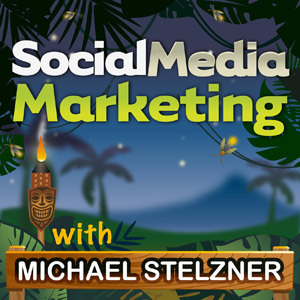 Listen to the show to hear examples of significance, as well as how priority dilution works. Rory explains the focus funnel, which is a visual depiction of the thought process that multipliers use when deciding what tasks to spend time on. The focus funnel is a depiction of how multipliers decide what to spend time on. At the top of the funnel is “Eliminate.” The first question multipliers ask themselves is, “Can I eliminate this task? Is it even worth doing?” Multipliers realize that next-generation time management is much more about having a not-to-do list than a to-do list. Anything you say no to today will save you time tomorrow. 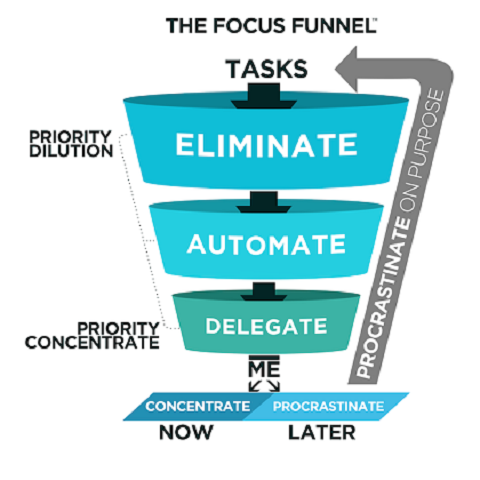 If you can’t eliminate it, it drops down to the middle of the funnel, which is “Automate.” Anything you create a process for today will save you time tomorrow. Automation is to your time what compounding interest is to your money. Compounding interest turns money into more money, and automation turns time into more time. If it can’t be eliminated or automated, it goes into the third funnel, “Delegate.” People think that no one else will be as good at a task or it would be faster to do it themselves. Rory suggests trying the 30x rule: Consider spending 30 times the amount of time it takes for you to do a task training someone else to do it. For example, if a task takes you 5 minutes every day, the 30x rule suggests it should take you 150 minutes to train someone how to do it. If you make the significance calculation and think beyond the construct of one day, it makes sense to spend that amount of time training someone else to do it. A 5-minute task done 250 working days in the year means you’ll spend 1,250 minutes doing the task. Spend 150 minutes training someone to do this task, and you will get a 1,100-minute gain. That’s a 733% return on time invested. Listen to the show to discover how saying no frees up your time. Rory says marketers who don’t want to delegate for whatever reason need to consider the MVOT calculation: Money Value of Time. Everyone earns an hourly rate of pay, even if they are not paid hourly. If you take the total amount of money you make and divide it by the number of hours you worked, you come up with your MVOT. Someone who is earning $100,000 a year and working 50 hours a week makes about $62 an hour. If you are not delegating and paying someone else to do certain tasks, that’s what you are paying yourself. So if you aren’t paying an assistant, you are that assistant. Rory continues by describing what happens at the bottom of the funnel to tasks you can’t eliminate, automate or delegate. Those are tasks that need to be done and need to be done by you. 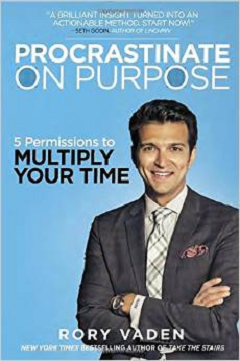 Procrastinate on Purpose by Rory Vaden. If a task needs to be done now, you can concentrate. You are given the permission to protect your focus and eliminate distraction. If the task can be done later, then you are given permission to Procrastinate on Purpose (POP). Pop that activity back to the top of the focus funnel, where it will cycle through the funnel until ultimately and inevitably one of the four strategies (eliminate, automate, delegate or concentrate) will be executed. If something can continually wait, you will eliminate it. Perhaps you’ll discover technology that will allow you to automate it or somebody will rise to the call of leadership and get it done for you. Rory says while his first book is on how procrastination is the foundation for a mediocre life and the second one says you should procrastinate on purpose, both are true. There is a major difference between waiting to do something you know you should be doing but don’t feel like doing versus waiting to do something because now is not the right time. Procrastination is not going to the gym because you don’t feel like it. When you wait to do something, that is not procrastination. That is a virtue. Listen to the show to learn how to know if you are a chronic overachiever. Creative people should be creative, Roy explains. That’s how you multiply your impact. One of the reasons we burn out is we’re trying to satisfy everybody else. We have to realize our highest value to others is to be our highest self. Ultimately the focus funnel is a methodology to help determine what is the one thing only you can do. Then you want to eliminate, automate, delegate or procrastinate on purpose everything else. It’s about freeing ourselves from the tyranny of the urgent, which is what Charles Hummel called it in the 1963 essay of the same name. It’s about freeing ourselves from trivial things, as well as freeing our self-worth from being attached to the volume of things we complete. We need to give ourselves permission to be creative, do the things only we can do and be able to explore, while having a system to handle everything else. That way, we can multiply our time, results and ultimately our value for ourselves and everyone around us. Listen to the show to hear final thoughts from Rory. We used this alert app during Social Media Marketing World to let us know when a certain help hashtag was being tweeted. For example, to do a Twitter alert, just set up the app, go to Twitter search and plug in the hashtag. Then every time someone tweets that hashtag, you are notified with a ding on your phone. There are hundreds of channels, including music, sports scores, weather, stock prices, shipping tracking and even a channel to let you know when a new Netflix movie shows up. Just think of any channel and then think of anything you would want to be notified of on that channel, whether it’s an RSS feed, a tweet by a certain person or when a website is down. Turn the alerts on and get notified through the app. Hooks is a free app for iOS only. Listen to the show to learn more and let us know how the Hooks app works for you. Connect with Rory on his website and check out his blog. Learn more about Southwestern Consulting. Watch Rory’s free 1-hour webinar on 5 ways to multiply your time. 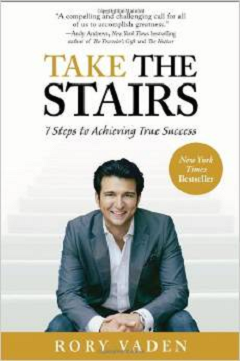 Read Take the Stairs and Procrastinate on Purpose: 5 Permissions to Multiply Your Time. Follow Rory on Facebook, Twitter and YouTube. Connect on LinkedIn. Listen to the Daily Discipline with Rory Vaden podcast. Read The Seven Habits of Highly Effective People and Tyranny of the Urgent. Learn more about Southwestern Advantage and the 30x rule. Check out the Hooks app. What do you think? What are your thoughts on time management? Please leave your comments below.